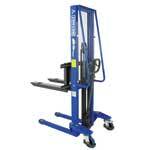 Lift Safe’s manual stacker’s are the key tool to lift and store goods within limited space for maneuvering. The varied options on these stacker’s make them the ideal tools for a wide variety of applications, such as; Roll Handling, Reel Lifting and Film Lifting. 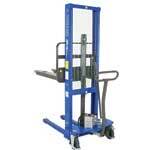 The ALFA M is a manual push and pump stacker. It has a 1,000kg maximum capacity and a maximum lifting height of up to 1,600mm. 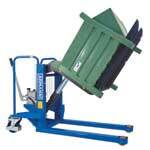 The ALFA MRF is a manual push and pump stacker, specifically designed for tilting and emptying requirements. It has a 1,000kg maximum capacity and a maximum lifting angle 85 degrees. The TM is an manual lifting table which is lifted by the user via a double effect manual pump. It has a 1,200kg maximum capacity and a maximum lifting height of up to 1,600mm.